The BBC’s annual Sports Personality of the Year award will be handed out on Sunday evening, and never in the 58-year history of the award has there been a stronger batch of contenders. The 12-person shortlist is packed with Olympians and Paralympians, many of whom have achieved historic feats in 2012, and there is also room for the world’s No1 golfer. In alphabetical order the contenders are Nicola Adams, Ben Ainslie, Jess Ennis, Mo Farah, Kath Grainger, Sir Chris Hoy, Rory McIlroy, ANDY MURRAY, Ellie Simmonds, Sarah Storey, David Weir and Bradley Wiggins. Frankly, only four of those have any hope of winning and Wiggins (hot favourite) Ennis, Farah and Murray will surely share three podium places between them. 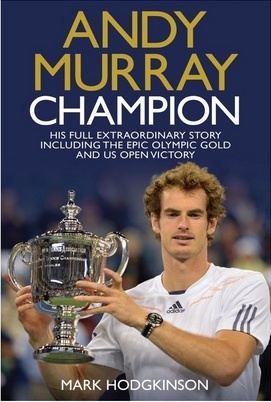 Yet, as Murray’s biographer MARK HODGKINSON contends, Murray alone can claim solo and historic magnificence in 2012 while also being able to claim his (truly global) sport has never been better. ONE – He is operating in a golden age; Bradley Wiggins plainly isn’t. Indeed, most would consider this to be cycling’s age of doubt, something less than golden. Winning a Grand Slam in any era is no small achievement. But Murray had the misfortune of sharing an era with two of the greatest players of all time – Roger Federer and Rafa Nadal – while Novak Djokovic, his opponent in the US Open final, has five Slam titles. Even if Murray never wins another major, no one should ever accuse him of being a one-slam wonder. There has never been a harder time to win a Grand Slam, and Murray won one, in an era quantifiable as the most perfect era tennis has seen. TWO – For all the attention on the unsmiling face of Ivan Lendl, Murray was out there on his own when he won Olympic gold and the US Open. He won those titles as an individual. Lendl’s presence at the side of the court in New York plainly helped (he wasn’t at the Olympics). But it was Murray who did all the grafting, who toiled away at the baseline. This was a solo effort. The same cannot be said for Wiggins during the Tour de France, who had the support of team-mates who had put aside their personal ambitions to help Wiggins win the race. THREE – Because it would annoy all the ‘Anyone but Murray’ jihadists (there is no more tiresome group in sport). Victory on Sunday would kill the idea that Murray is an unpopular figure, that the public feel no warmth towards him. It would also be a formal recognition of the new relationship between the Scot and the Great British public. Consider that all those keyboard warriors who loathe Murray for a joke he made as a teenager about the England football team would hate the idea of Murray winning an award decided by a public vote. Ignore what happened at The O2 the other week, during Murray’s match against Roger Federer at the season-ending Barclays ATP World Tour Finals. Yes, the crowd favoured Federer, but, according to executives at the tournament, that was because the Swiss tennis public had block-bought tickets months in advance. Ignore the noisy Swiss, provoke the Murray haters. Vote Murray. FOUR – Jessica Ennis and Mo Farah helped to produce that golden Saturday during the Games. And one of the iconic images of the Olympics was of Bradley Wiggins sitting on a throne at Hampton Court. But consider what Google disclosed this week, that Murray was the most searched-for British Olympian. Murray, by defeating Roger Federer in the singles gold medal match, and then with the bonus of winning a silver medal in the mixed doubles event with Laura Robson, had as much impact as any other British Olympian. If not more. FIVE – Murray’s tears after defeat in the Wimbledon final was the most emotional moment in British sport this year. Murray doesn’t have Wiggins’s sideburns or wit, and he doesn’t have a celebration that captured the public’s imagination like Farah’s Mobot, but no one should ever again accuse him of lacking personality. There is a case to be made that he’s the most complicated individual on the short list.